The next major work is the grinding of the horn cheek faces, all twelve of them and their 24 side faces. The SVR has begun grinding these latter to make them flat and vertical. 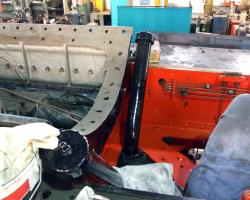 This is a slow and tedious process, and it is hoped that the grinding machine from the 4253 Group on the Kent and East Sussex Railway will complete the job much faster. 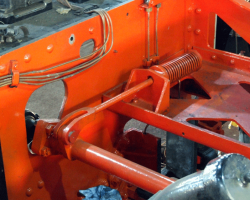 Once done, it will allow the axleboxes to be machined to size and the engine to be rewheeled, so many other jobs are dependent on this job’s completion. Other work tackled by the Fund’s working party is the reinstallation of all the lubrication pipe runs, a job almost complete. 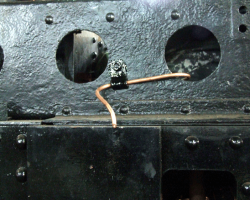 Here is a SVR modification which supplies oil to the rubbing pads between the loco and tender’s intermediate buffers, and one of the more visible runs. Completion of work to the forward cross stretcher mounting the pony truck pivot has allowed the replacement of the leading sandboxes. This view shows the newly painted filler pipes leading to them. 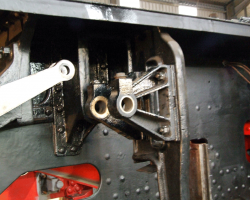 A little further rearwards is the balance mechanism for the valve gear to make the driver’s job in turning the reverser wheel a little easier. The method is a coil spring, seen here after final reassembly. Again, note the lubrication pipe runs. The mounting brackets for the expansion links have been refitted, but not the links themselves. These would complicate the job when the new valve chest liners are installed so have been left off. 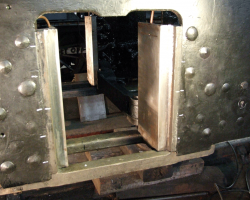 The inner brackets are therefore permanently attached while the outers merely positioned for trial fit only. The pony truck continues its isolated existence at the south end of the works but has not been forgotten. It has been turned over to allow access to the underneath parts, to which a Fund member is applying grey primer paint. For general enquiries concerning the Stanier Mogul Fund please contact us here.